Please welcome Kevin Sessums, who last reviewed Bad Jazz for Towleroad. You can also catch up with Kevin at his own blog at MississippiSissy.com. William Finn is a kind of sophomore Sondheim – though certainly not a sophomoric one. His tunes more jaunty than Sondheim’s, his lyrics less jaundiced (and, yes, less intricately accomplished), Finn is still the musical theatre’s closest approximation to a Sondheim progeny, a lineage that can be traced back to Sondheim’s own mentor, Oscar Hammerstein II. Finn has created one great and timely musical, Falsettoland, about how the AIDS epidemic affected the modern American family. Indeed, the suite of songs from Falsettoland which anchors Make Me A Song, The Music of William Finn at the New World Stages at 340 West 50th Street, can still sear the heart. Finn is not afraid to take aim right at one’s heart — or one’s funny bone. In this wondrous musical review of his work, we laugh at the way he turns his political anger into a wry sophisticated lament in “Republicans” and turns that wryness into a hilarious pessimism in “Billy’s Law of Genetics.” Teetering on sentimentality but never taking that final plunge, he keeps his heartwrenching balance — as he keeps us off ours — in the ballads, “I Went Fishing With My Dad” and “Anytime (I Am There)” Though about the latter, he writes in the program, “While my great friend Monica Andress was dying, she asked me to write a song for her funeral that would make people cry. It’s the only song that, while writing it, made me cry endlessly.” The night I saw the show, there weren’t many dry eyes in the audience after Sally Wilfert literally stopped the show with her rendition of the song. The other performers — Sandy Binion, D.B. Bonds and Adam Heller were equally stellar and brought their own singular takes to this singular — Sondheim references aside — voice in the American musical theatre. 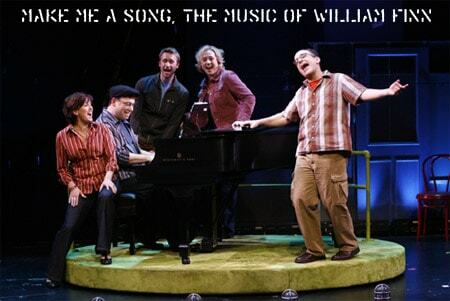 Make Me A Song, The Music of William Finn, New World Stages / Stage 5, 340 West 50th Street, New York. Ticket information here. There were no works, alas, in Make Me A Song from Finn’s The 25th Annual Putnam County Spelling Bee, which is still packing them in at Circle in the Square. It is scheduled to end its run in January yet the Sunday afternoon I caught a performance it was standing-room-only. I saw the production when it first opened and it is still one of the most refreshing shows on Broadway. A love letter to all the brainiac nerds – one assumes Finn must have been one at some point in his life — who have endured their adolescences, Spelling Bee is that rare show on Broadway which parents and their kids alike — and even hip urban GLBTs — can appreciate on many elemental and sophisticated levels. If you haven’t seen it, by all means catch it before it closes. An utter delight. The 25th Annual Putnam County Spelling Bee, Circle In The Square Theatre, 1633 Broadway, New York. Ticket information here.